The Entlebucher Mountain Dog temperament makes him a tough, sturdy dog who loves his family as much as he loves to roughhouse! Given that you are interested in the breed you will want to get familiar with these six “must-know” temperament traits. 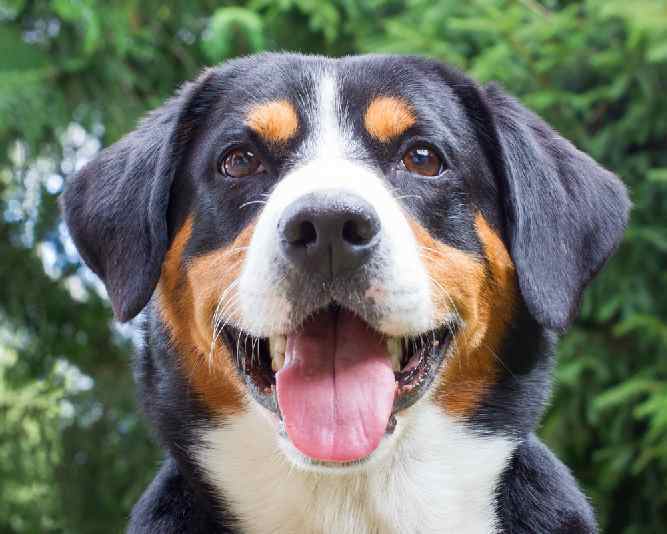 Learning about the Entlebucher Mountain Dog temperament will help you know what to expect and understand why your dog behaves a certain way. He doesn't bark unless he's confident there's a reason to bark. This is a very good thing because when an Entle barks, you know to pay attention. That's what makes him such a fantastic guard dog. The Entle loves his family with all his heart. Because of this, he is suspicious of strangers. This makes him a good watchdog, in addition to being a good guard dog. Some dogs can only do one or the other well, but the Entle has both qualities mastered. Be careful when you try to play rough with this dog. He'll take you up on it…and he'll probably beat you at it, too! This is a strong dog that may surprise you with his strength. However, keep in mind that he is a working dog, so it makes sense that he is so strong. The Entle is happiest when he is taking care of his family. He's great with children, though he's way too rowdy for a home with toddlers. You don't need a big dog knocking them down all the time, scaring them and potentially hurting them. However, with bigger kids, he loves playing fetch and other games in the yard. He loves to stick his nose into everything that goes on at home so he can keep an eye on his loved ones and make sure they're okay. Most working dogs are intelligent. This is because, in addition to being burly, they must also know how to solve problems in order to be effective at their jobs. The Entle is no exception. His confidence stems, in part, from his intelligence. However, his intelligence may also make him more stubborn to train. He may test you to see if you are serious about what you're trying to teach him. Hold your ground and remain consistent, and he will come around to respect you as his leader. He doesn't need any help to solve a problem. He can figure it out all on his own – just give him time. Entlebucher Mountain Dogs belong to the Sennenhund group. The Entle became an official breed in 1889. Until that point, there was no attempt to classify them as a separate breed from the similar Appenzeller Sennenhunds. The Entle's original purpose was for guarding and herding flocks. Over time, they evolved to become more of a companion dog. 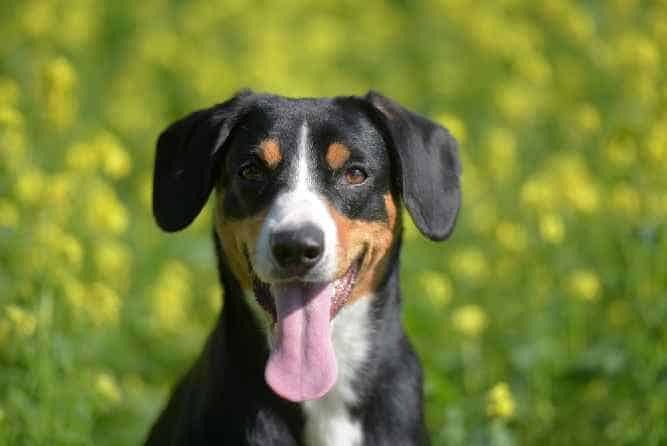 The Entle had nearly disappeared as a separate breed by the early 1900s, thanks to breeders creating Entlebucher Mountain Dog shepherd crossovers. It's funny to consider the idea of Entlebucher Mountain Dog vs. German Shepherd because the two look nothing alike! Few dogs are a treat to train. The Entle is one such dog. If you train him with a happy and positive attitude, he will reward you ten-fold. If you try to scold him with a spanking, it's less effective. This is a dog that has a high threshold for pain, so smacking him will only hurt your hand – that's about it. However, because he is so intelligent, it is easy for him to get bored. Keep him interested, keep him challenged, and you will have no trouble training him. Let his mind wander, and his body will want to follow – and you will want to tear your hair out. If you feel like you can benefit from some help to train your Entlebucher then check out the DoggyDan's The Online Dog Trainer. It's an excellent resource! The Entle may look like he requires regular grooming, but he’s actually not that much trouble to maintain. Wipe him down with a damp towel when he’s between baths to keep him looking and smelling healthy. However, for the Entlebucher Mountain Dog, shedding is a frequent occurrence. Brush him regularly to prevent the mess from spreading all over your house. Check and clean his ears weekly to prevent infection. As for the typical Entlebucher Mountain Dog colors, he is a tricolor dog with a coat consisting of black, tan, and white. The average Entlebucher Mountain Dog size, no matter where male or female, is between 17 and 20 inches high. The Entlebucher Mountain Dog’s life expectancy is between 11 and 15 years. Note: Don't let the many issues above scare you. The best way to approach health problems is to prevent them in the first place. The Ultimate Guide to Dog Health is a great place to start. Get a copy to keep at home. It will help you prevent the painful health issues that can plague your Entle Mountian Dog from expressing his winning personality and maximizing his life expectancy. On a scale of one to ten, the Entlebucher Mountain Dog’s energy level is an 11. You must be an active person if you want to have one of these dogs in your life. He needs at least an hour of exercise each day to stay fit and healthy. If you like to run, hike, or bike, then this is your dog. The Entle is the very embodiment of the belief that a “tired dog is a good dog,” so be sure to tire him out! If you’re interested in purchasing an Entlebucher Mountain Dog puppy, you may not be sure where to start. 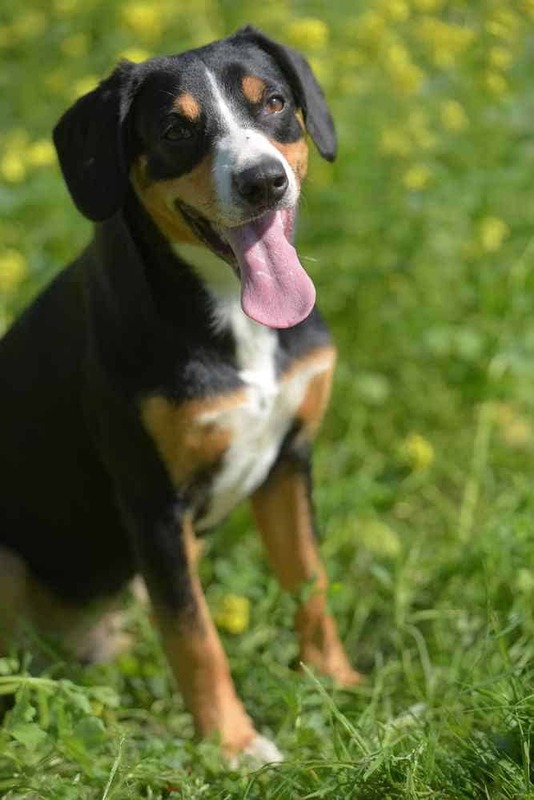 You can find Entlebucher Mountain Dog puppies by researching breeders who specialize in the breed, or through your local rescue or adoption agencies. The average Entlebucher Mountain Dog price is around $1,200 to 1,300. However, it’s not uncommon for the Entlebucher Mountain Dog cost to hover closer to $1,800. The price of a puppy all depends on who’s selling it, what its lineage is, and where the puppy is located. If you want to adopt an Entlebucher Mountain Dog puppy, you have several options available to you. Check your local rescue organizations and adoption centers to see if they might have one available for adoption. Entlebucher Mountain Dog puppies for sale will always be more expensive than a dog that you adopt or rescue from a shelter. 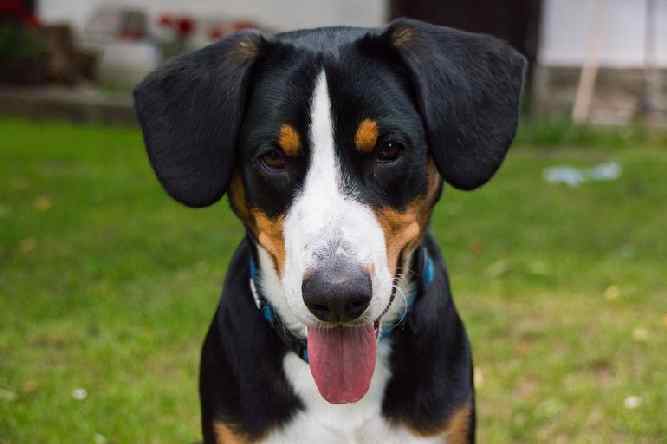 If you’re interested in an Entlebucher Mountain Dog mix, then adoption is a great way to go. This is because people don’t usually put purebreds up for adoption. It can be difficult to determine on your own which breeders are legitimate and which ones fall far short of being professionals. A good resource to consult is the National Entlebucher Mountain Dog Association. The top goal listed on the organization’s website is to promote quality breeding. Of course, bad breeders can still always slip through the cracks of even the most esteemed and careful organizations. Be sure to do your research before paying top dollar for the dog of your dreams. Conclusion: Why the Entlebucher Mountain Dog? The Entlebucher Mountain Dog temperament makes him the perfect dog for a colder climate. This is because he's a tough working dog, so he doesn't mind hard labor in harsh conditions. He can also be a softie who loves to snuggle up with his family. This is not a yappy dog who barks “just because.” When an Entle barks, you know he has an important reason for demanding your attention. If you like to roughhouse with your dogs, be careful with this one. The Entle will go toe-to-toe with you, and he may surprise you with his strength and agility. While Entles are generally healthy, there are more health problems that may affect this breed. Keep an eye out so that if any crop up, you can address them as soon as possible. Next post: Living with the Belgian Tervuren Temperament (Energetic, Intelligent, Protective): What More You Can Expect? Previous post: Bedlington Terrier Temperament: What Should You Expect?